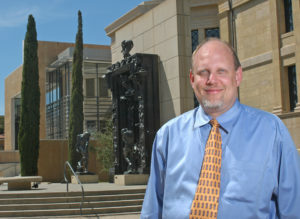 David Magnus, director Center of Bioethics, Stanford, in front of Rodin’s Gates of Hell. According to a March perspective piece by three Stanford researchers in the New England Journal of Medicine, while there is tremendous potential for machine learning to aid in expanded electronic records, efficient data-mining and health monitoring, there are also relevant challenges that may hinder the efficacy of machine learning systems in medical practice. Senior author of the piece and director of the Stanford Center for Biomedical Ethics David Magnus Ph.D. ’89 divided the major ethical concerns into three levels: the design of the algorithm, the data set being utilized and the societal implementation of machine learning. Magnus explained the ways in which bias can be built into an algorithm both unintentionally and intentionally. Magnus gave the example of an algorithm that allocated intensive care unit (ICU) beds based on insurance status of patients gathered from electronic health records. While this framework may be beneficial to the interests of private-sector designers, he said, it sacrifices the best interests of the patients. Magnus argues that this discrepancy creates tension between the goals of improving health and generating profit. According to medicine associate professor and paper co-author Nigam Shah postdoc ’07, machine learning has potential applications in diagnosis, prognosis and suggested courses of treatment in a clinical setting. However, the recommended courses of action that machine learning algorithms propose are dependent upon existing data sets that may contain inherent biases. In order for machine-learning medical systems to be most effective, it is important that their shortcomings are understood and accounted for. According to Magnus, however, algorithm developers and end clinician users tend to be disconnected in the process of development. As a result, Magnus said, end users might not be fully aware of the limitations of the programs they employ. For example, he pointed to the example of genome-wide association studies, which currently lack racial heterogeneity. “I think coming to understand [machine learning] and its vulnerabilities and pitfalls will be an important part of being a critical thinker,” said paper lead author anesthesiology, perioperative and pain medicine assistant professor Danton Char. Magnus agreed, adding that he expects to see a shift in clinician training to account for the growing presence of machine learning in clinical settings. While it has been proposed that machine learning systems may one day replace specialists such as radiologists and pathologists, Char said that these systems have not yet demonstrated the ability to think independently of what they have been taught. Shah agreed that there must be further research and development before machine learning can be relied on to a greater extent.